Migration and immigration are one of the priority areas of our Dominican Call to Justice. “Our call is to welcome the stranger, to speak the truth of our own immigrant nation, and to advocate for just immigration policies and practices.” The current government shutdown in order to finance and build a wall along the southern border is of grave concern. What is the just and humane way to secure our borders and treat those fleeing persecution? This is the question asked in this statement from the Maryknoll Office of Global Concerns (below). This is a moral moment in the United States. The government has been partially shutdown for more than twenty days now. People are not receiving paychecks and essential services. A government shutdown is not the way to solve a political disagreement. As more people are hurt by this impasse, the question at the heart of the matter remains unanswered: What is the just and humane way to secure our borders and treat those fleeing persecution? It is not with a border wall. Urge your Senators to support the House legislation and fund the government. Every day the federal government stays closed, hundreds of thousands of people go without pay and vulnerable people in our communities go without essential services. Migration and immigration are one of the priority areas of our Dominican Call to Justice. “Our call is to welcome the stranger, to speak the truth of our own immigrant nation, and to advocate for just immigration policies and practices.” The current government shutdown in order to finance and build a wall along the southern border is of grave concern. The message above is from a report shared by The Maryknoll Office of Global Concerns. The Maryknoll Catholic Foreign Mission Society of America consists of men and women religious and lay missioners serving around the globe. Their physical presence in Washington, DC and on the border between the United States and Mexico, and their dedication to the message of the Gospel compels us to listen, to take their witness seriously, and to respond to their call for justice. Their concern includes both the proposal for a wall and the government shutdown. 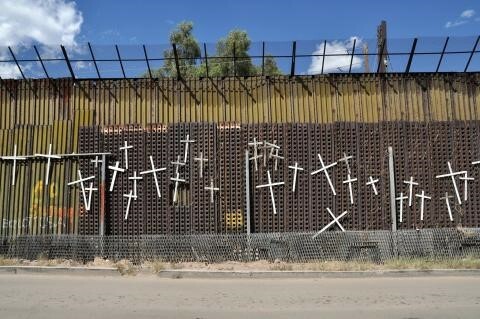 Based upon their analysis of the partial government shutdown over border wall funding as of Day 20, Maryknoll issued this analysis and position statement and shared with North American Dominican Justice Promoters. Our Dominican Promoters of Justice have made the decision to share this position statement. If you are moved, as we are, to respond to the gravity of the government shutdown in order to finance a wall along the southern border, consider how faith in action can be realized. Pray on your own. Pray and Worship with us.